If you look closely at my author photo, you'll notice a dog looking out the window. 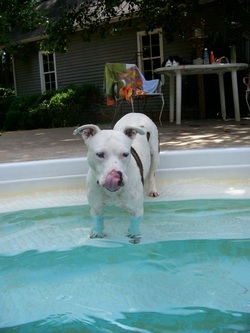 That's Moxie, shown here about to take a swim. She's an American Staffordshire Terrier that we adopted from the animal shelter several years ago. And she was the inspiration for the character of Luna in THE WEREDOG WHISPERER.